Level Field: Is it truly a soccer agenda? A great deal has been written in the newspapers and blogs, since the announcement of the FA of Malaysia's agreement with a Sports Ministry proposal for a full-time national soccer team on Monday. I have taken my time to give my views for several reasons. The first was the unfortunate passing of the eldest brother (S. Naveen Shanmuganathan) of national hockey skipper, S. Kuhan. The funeral was yesterday and fellow blogger and former colleague, S.S. Dahliwal and I, attended it yesterday, which almost took the whole day. Secondly, I was really trying to digest what the whole announcement despite FA of Malaysia earlier having said that it cannot be done. There was something missing in the announcement and I was trying to figure out, what it was. Thirdly, I was absorbing all the pros and cons raised by the likes of Datuk Peter Velappan, the coaches, soccer officials and of course fellow blogger and former colleague too, Rizal Hashim aka Loose Cannon. Then I came across Berita Harian's Khawari Ahmad Isa's comment in his blog, as i see it...plain and simple. Khawari's posting simply stumped me because he was taking a different stand from Rizal and he was actually pleading to give the Sports Minister, Ahmad Shabery Cheek (left), a chance to go ahead with the idea. Khawari has been known to be critical writer especially when it comes to soccer and the powers to be. But his soft stand really took me by surprise. Does he know something the rest do not know. And Rizal's comment to Khawari, where the former virtually apologised for his earlier stand and said that he should have checked with the Minister, again suggested that something is classified information for the "chosen ones" only. However, after having digested everything, my stand is that the proposal has it pros and cons. But the cons outweigh the pros. Every reason given by Velappan, the coaches, soccer officials and Rizal is 100 percent valid. And so is the Sports Minister's stand that they have to take this approach because the national players are not improving when they play for the States. But to take away the national players from the Malaysian League is too drastic. To take away the best players from the M-League is as good as killing the League. 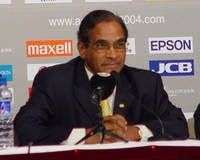 It does not matter what former national coach B. Sathianathan had said then - that M-League is no League - and now as the Kelantan coach, said: " We must also remember that the successful Under-23 players must be considered senior players by an definition and have managed to develop their skills by plying their trade in the Malaysian leagues." Velappan statement that clubs are the nucleus for football development and FAM's idea of a fulltime national team is akin to building a house without a foundation, perfectly sums up what a National League is to soccer development. However, I am surprised that none of the newspapers actually spoke to the players themselves to find out how they felt about the whole idea. Maybe they were saving it for today. The players views would definitely be interesting and should be the decider whether the Minister's proposal should go ahead. But before that, ask Akmal Rizal Ahmad Rakhil and Juzaili Samion, who had stints in Germany where they were housed in a Malaysian home with Malaysian home-cooked food, but why they still returned because they were homesick and could stand the weather! And that is the crux of the issue here. Malaysian players with their cultural background are NOT ready for overseas stints. We are not like the Koreans, Japanese or Chinese. Malaysian are very sentimental people with a lot of attachments, a pampered lot and really do not what is sacrifice all about. At 23 the players already have their set ways and habits. It is almost impossible to change anything at this late stage. That is why, when the idea came up not so long ago to send younger athletes (from the ages of 15 to 18) to be based on foreign soil to emerge themselves with "dog eat dog" environment to build a stronger character and return as a different breed of Malaysians, it was sad that many did not see the bigger picture and killed it. We had top European clubs youth teams at our shores not so long ago which could have been a permanent feature, but was also killed. Imagine if the FA of Malaysia and the States FAs had all linked themselves with these top clubs for a twining programme to send out young footballers overseas and what kind of future for Malaysian soccer would have been on the horizon. Now the Sports Minister is planning to go to clubs in England, Europe and Asia to speak to them for stints for the national team. Firstly will these top clubs have time for Malaysian players. We have had reports of Malaysian players on stints being used as linesmen, ball boys and picking up soiled jerseys and socks from the field after a training session by the club's senior team with supermarket trolleys! How different is it going to be this time around? Another question? How is national team being divided in smaller groups and sent to different countries going to help. Each one, provided they learn something, will return with different approaches to the game. And does the team coach K. Rajagobal feature here? Is he going to be traveling from one country to another to monitor his players? My suggestion is simple. Just create regular windows during the M-league, assemble the national team and arrange for them to play top notch matches at home and overseas or have short overseas stints. This way, the M-League will not lose its attraction and at the same-time, the national team is assembled regularly and get their training and exposure. But having said all that, I still believe there is a hidden agenda behind the full-time national team. And for the Sports Minister to be firm about a full-time national team, there is somebody in the background who has promised a big plan. The question is, at what price. Who is this person? All things point to a foreigner. Is he someone who had dealings with the Sports Ministry and is full-time national team plan, part of settlement deal? I really do not know. I am just throwing questions. Obviously Khawari knows something many of us do not. Or has he been asked to soften the blow because it is a national agenda coming from the top guns in the country? Or is there another agenda? The fact is that with nothing concrete to show in terms of plans for the team, the announcement has been made for a full-time national team, despite Indonesia having attempted and failed miserably. I suppose only Datuk Shaberry will be able to give the real picture. So till then, let us all keep guessing what is the fate of Malaysian soccer. And let us be reminded that we have only defeated Vietnam in the Sea Games soccer final and it is only the Sea Games. I had warned earlier about going overboard with this victory and that we should take one careful step at a time, to move up the ladder. Big leaps could find us falling into puddles. And lastly, a foundation is always from the base and not from the pinnacle. That is how development works. Let us work on the current team with proper visions and goals. We cannot have a World class team overnight from a Sea Games gold medal. There is no short cut to success. Can somebody start talking about grassroots development, namely schools, extra PE periods in schools and coaches development programmes and utilising former national players at schools? Well Tony, what Sathia said still matters. Quote from Dato Reduan "Based on our analysis, the fitness level of national players drops when they return to their state or club teams. Such fitness levels might be enough to win domestic titles but not enough to win at international levels," he said after handing out incentives to the players. IS the FAM Vice-President is now finally acknowledging that B.Sathianathan now famous quote "the M-League is not FOOTBALL" was the the truth and nothing but the truth of Malaysian football and the former National Coach was right all this while for saying it. Why was he then sacked?. 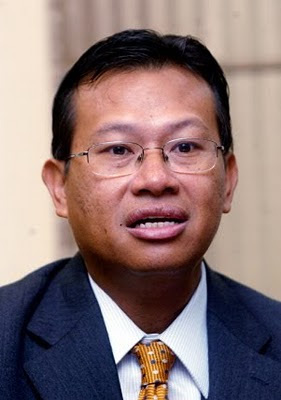 Will Tuanku President now sack Dato Reduan for repeating after Sathia?. Sathia knew that his boys will not be fit enough when they report for training to play in the Asia Cup qualifying match against UAE and duly requested for a 10 day preparation. But the powers in FAM said NO! 5 days is enough - result 0-5 and he gets the sack. Was there a conspiracy among those in power in FAM to get rid of Sathia?. Having run the Malay Mail team and covered football at the height of its glory, Tony, you have many tales to share, no doubt. But it seems those who are supposed to advise the minister are not doing their jobs properly. on the subject of hidden agenda and chosen ones, hahaha, perhaps you are right. I just hope things are not being swept under the rug. if at all there is a third party involved, then reveal all. it is sports after all, it belongs to the people. p/s itu dvd nanti saya bagi, belum ambik la kat ofis.